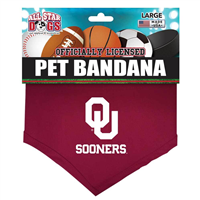 This officially licensed NCAA Oklahoma Sooners dog bandana is made of cotton shirting with silk-screened team graphic. Traditionally tied or with a collar run through the opening. Made in the USA. Cotton Lycra fabric. Machine wash. Tumble dry low.